This new volume in the distinguished Praxiology series examines the confluence of praxiology, pragmatics, and systemics in the study of systemic change through human inquiry, particularly small group activities, human organizations, and globalizing trends. It covers core concepts indigenous to organizational life. The author presents and subsequently integrates several conceptual schemes relevant to human beings and small groups engaged in human inquiry for systemic change in organizational settings. Each key concept in the volume is covered in a chapter theme that articulates the praxiology and pragmatics of human inquiry. Chapter 1 examines change as a systemic idea from a research methodologist's point of view. Chapter 2 articulates numerous points to distinguish systemic from non-systemic research methods to bring about systemic change. Chapter 3 discusses the prevalence of hierarchy and control. Chapter 4 focuses on "disciplinarity," viewed as one kind of quest for understanding complexity and change. 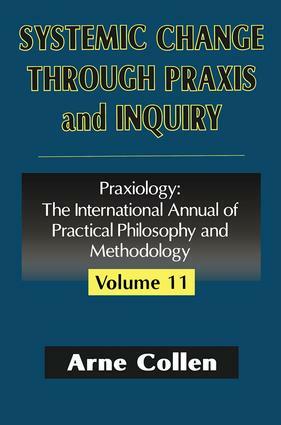 Chapter 5 describes praxiology in inquiry. Chapter 6 elaborates on emergent forms of praxiology. Chapter 7 demonstrates the viability of systemic change through praxiology. Chapter 8 targets the general features of research process that are the means to effectuate systemic change, while Chapter 9 elaborates on these means toward developing systemic inquiry to systemic change. Chapter 10 discusses "complexification" in human inquiry and systemic change. Systemic Change Through Praxis and Inquiry is a pioneering effort to attain a more integrated view of research methodology for human inquiry. It will be of great interest to students of business, management, and organizational studies. Arne Collen is a long-standing member of both the Executive Faculty at Saybrook Graduate School in San Francisco and the Research and Teaching Adjunct Faculty in the California College of Organizational Studies and the California College of Professional Psychology of Alliant International University, San Francisco Bay Campus. He is a research methodologist, who, over the last three decades, has applied systemic and sociocybernetic perspectives to advances in research methodology for human inquiry. With Wojciech W. Gasparski, he is co-editor of Design and Systems, Volume 3 of the Praxiology series.